At least I think it is A.californica. It looks just like A. californica I saw elsewhere, and I found it wild growing in a garden of a friend in California, so I guess it must be, right? 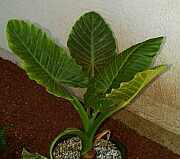 Another photo of the same plant, a couple months later. It definitely does not want to grow above 3 ft tall. 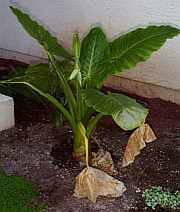 In the spring of 1998, it started flowering, which should make it possible to finally ID the plant. 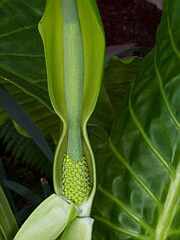 The inflorescence lasted for about two weeks and had no discernible scent. ... and the general habit of the plant. 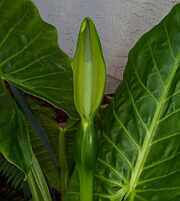 It is about three feet tall, and spreads to about 4 feet across. 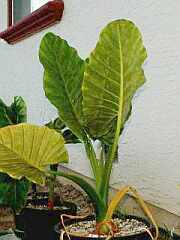 Back to the Alocasia index.